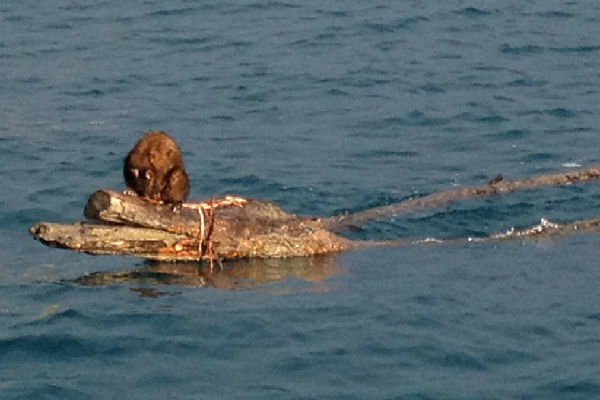 A bedraggled-looking possum floating on a log near Kapiti Island has hit the headlines recently. In a situation reminiscent of Robert Hewitt’s epic survival tale, where the keen ex-navy diver floated in the Kapiti currents for four days and three nights until being found by his navy friends off Mana Island, a possum floating on a log was seen and photographed last month travelling with the currents in the same area. The fishermen who spotted it took photos and video of it and, I have to say, I felt a bit sorry for the blighter. The possum looked cold, wet and downright miserable. If it were me, I’d probably have wanted to dispatch it, but the fisherman said he didn’t want to with his six-year old grandson on board. Fair ’nuff. But it does raise a bigger issue of invasion of our island sanctuaries, those “lifeboats” for our wildlife, without which many of our species wouldn’t survive in any great numbers. Kapiti is our oldest nature reserve, gazetted as such in 1897. In fact, it was the call for the protection of Kapiti (which was getting hammered by goats and sheep and other pests) by a chap called Captain Val Sanderson that was the catalyst for the creation of what is now known as the Royal Forest and Bird Protection Society of New Zealand in 1923. It took an enormous effort to get the last possums off Kapiti in the 1980s and since the predators have been removed, the island has been a sanctuary for native wildlife that includes hihi, takahe and the main and largest population of little spotted kiwi in the country. Little spotted kiwi are the size of bantam hens as adults, so simply cannot survive where there are predators, because a stoat can easily take an adult as well as chicks. In November 2010, a stoat was found on Kapiti Island. They’re good swimmers, but the 5km stretch is thought to be too much for stoats – so did a stoat float over too? In my view, probably not. I’d say one snuck on to a boat, and then hit paydirt when it got to Kapiti, an island simply bursting with native birds. It appears the stowaway stoat was a pregnant female, since at least three stoats have been found and killed since then, and the birds are doing fine. It’s unlikely that they remain, but it still cost a massive amount of money, time and panic to get the stoats off. Since then, we’ve had another open sanctuary, Ulva Island near Stewart Island, reinvaded by rats and one or two other situations where predators, through hiding, swimming or floating, have made it on to our valuable island sanctuaries. Every time this happens it costs us. A lot. These islands are our insurance policies for what remains of our wildlife, because we know that wherever there are introduced predators (notably possums, stoats, ferrets, weasels and rats) we are losing the battle to protect our beautiful native wildlife. For most species, to protect them entirely from predators, we must put them on predator-free islands, which must be AT LEAST 2km from shore (to counter the swimming ability of stoats, and possibly even Norway rats). There aren’t actually that many islands that qualify… so then what? I say a Predator Free NZ, of course. So wthough flotsam and jetsam that sport surfing introduced mammals might be quirky, amusing, or kind of sad (for the poor animal stuck on the raft), the bottom line is that it highlights the enormous threat our native wildlife face, and just how crucial those predator-free environments are. Have you ever seen a swimming stoat or rat? Spotted a furry hitchhiker while out fishing? What’s your view on the possum castaway?